You could say that Somerset signwriter, John Burton, likes motorbikes. Ask him how many he owns and he is genuinely stumped to provide an accurate answer. I suppose that in bald mathematical terms, the actual number isn't that great; 20-odd complete machines, with another half-dozen or so in various stages of rebuild. But when you haven't got room for one single, solitary bike outside your bijou south London peid-a-terre (as indeed I haven't) 25 bikes sounds like plenty. All Burton's bikes are four-stroke Hondas - every last lovin' one of 'em: he's been a Honda man ever since the early '60s when he worked for Pankhursts, one of the biggest dealers in the south-west. The direct Honda connection didn't begin until 1970, when Pankhursts finally gave in to the inevitable and took on the Big H franchise. Showing the kind of foresight for which the British industry rightly became famous, they'd already turned Honda down back in the Super Cub era. Even then, Honda's sales drive was on reheat. By 1975, the pressure was too much even for Burton, by this time already a dedicated fan. He decided to pack in the bike business in favour of the more relaxed signwriter's lifestyle. "Honda were a great company," recalls John, "and were especially good on warranty claims. But it was all too cut-throat - I had to get out." His first Japanese ride was aboard Honda's CB92 Benly, an OHC 125cc twin that had the legs on most British 250s of the time. 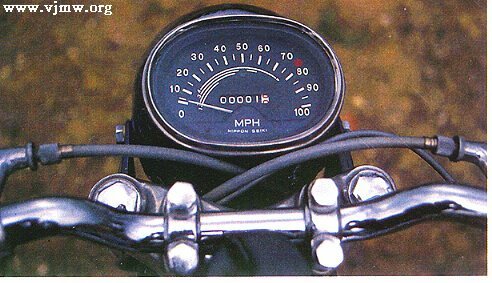 The CB160 came along in 1964. It was a bored-out follow-up to the CB92 125cc Benly twin, and the DOHC four-valve CR93 racers (now worth around 20,000 pounds) built between 1959 and 1964. Don't be fooled by the pictures: there's a direct link between this sweet-looking CB160 and the race bikes with which Honda first went to the Isle of Man in 1959. They didn't win then, as the little Hondas just didn't have the poke to mix it with the established European machinery. But they did win the team prize - and we all know what happens in later years. Trying to build on a race heritage they didn't quite have, Honda produced a CB125 road bike that was never imported into the UK. The CB160 was brought in, but even that didn't sell particularly well because of its unusual capacity that took it over the 150cc cut-off in force then. It died the death in 1966. It was a handy bike, though, good for nearly 80mph on the flat and an easy, all-day cruise of 70mph.The handling was reckoned to be leagues ahead of the old leading-link suspended Hondas, the dual seat was longitudinally-spring and very comfortable, the electrics were actually reliable and there wasn't even an oil leak. Contemporary British bike owners looked upon this oriental interloper in the same way that Red Indians must have gazed at the first steam trains to clank and rattle there way through their homelands - with a mixture of awe and fear. The Brit bikers must also have experienced downright surprise that something so diminutive and (horror!) Japanese was showing them the way home with so much room to spare. This CB160 is No. 52 off the line. How it came into John Burton's possession is one of those apocryphal-sounding stories that are so redolent of the age. A BSA rider called Mervyn Bleach rang John out of the blue in 1979 to say he was moving house, and would he be interested in taking this Honda - which was in bits - off his hands as he couldn't get it into the removal lorry. A price of 10 pounds was agreed, and by the time John got to the Bleach residence, Mervyn had gone - leaving the box of bits to be collected but forgetting to attach any forwarding address. "If he's reading this, perhaps he'll get in touch and claim his tenner," smiles John. The bike's green logbook didn't have Mervyn's fine name in it, but was instead registered to the almost equally baroque-sounding Humphrey Hamblin, a local grass track specialist. Closer inspection of the box of bits revealed the CB had been coverted to a left-side footbrake, giving the new owner cause to wonder whether Hamblin had been an unidexter. The truth was more prosaic: Humphrey had bunged a Bantam 175 engine in the Honda's chassis, as the original motor had been prone to losing its big ends. "The sump only holds two pints, so it was important to keep the sludge trap clean," explains John. Unaccustomed to Japanese technology, Humphrey had taken the soft - silly - option. The bike had been sold to Bleach with a Bantam engine in situ, a fact unknown to Burton when he bought it. ), he hoicked the box out of the corner, chased away the spiders and began the restoration. Mechanically, the CB160 was endearingly simple. The cylinder block was a light alloy, one-piece affair with pressed-in liners and the single forged crankshaft was chain-driven at the centre. The whole thing was very easy to work on, thanks in no small part to the single-tube spine frame, which allowed the engine to be dropped like the proverbial hat. No front chassis downtube was necessary because the engine was a stressed part of the frame, courtesy of cast lugs on the cylinder head. Burton did almost all the restoration work himself, including building up his own wheels and spending days on mixing up the right shade of blue. The only job he didn't take on was the chroming. Being a student of the 'don't over-restore' school, he regrets that modern chromers always over-polish items "no matter how much you ask them not to." The whole job took nine months from start to mid-1983 finish. And it has never been started up since then. Authentic right down to the original pattern tyres, John has even taken all the studs out of the crankcase and zinc-plated them - even though they'll never be seen. "Some parts are difficult to come by now," says John. "Tank badges and silencers are unobtainable, other than through the VJMC." He's full of praise for Dave Silver, the Suffolk-based Honda spares specialist. "He gets his bits from all over the world and sells them at reasonable prices. Good job, too - you can't get anything from Honda themselves. They smash everything up." The 160 doesn't yet have the collectability of those early Benlys, and so it's worth maybe 1000 pounds. Not that Burton is planning to sell it - or indeed any other bike from his stable, which incidentally includes a totally original '61 Benly complete with faded TT sticker on the front mudguard. Having taken on an obscure restoration for someone and then regretted it -"it got to the point where I was worrying every time the phone rang" - he now looks after only his own bikes. He's not entirely rooted in the past; there's a CBX in among all the middleweight twins and bigger fours stacked up in the workshop. But there's definitely a special place in his heart for the little old twins. "My wife nearly left me when I sold my first Benly. I wont make that mistake again." From Japanese Clasics September 1992. Written by Tony Middlehurst.